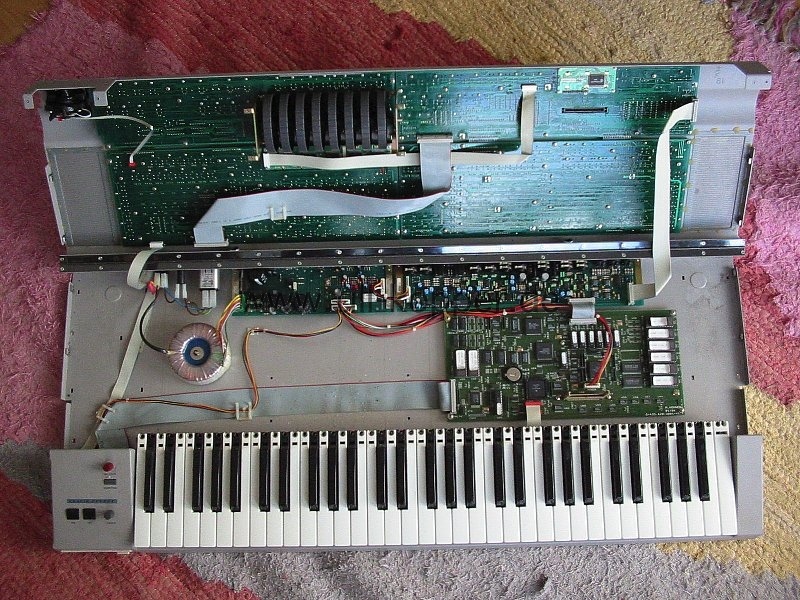 This keyboard was target for those one-man-bands that need a keyboard with auto accompany and a midi file player. So it is not a good synth at all. And it got mainly the full General Midi (GM) sounds plus a few more. So why did I bought it? For those automatics rhythms and things with automatic accompany? Well, you have to know, that this keyboard was done with the help of Waldorf, the famous very special synth company that build the WAVE and other great timeless and well known synths. ADAM stands for "Advanced Digital/Analog Musical-Instrument". It was introduced late 1994 early 1995. 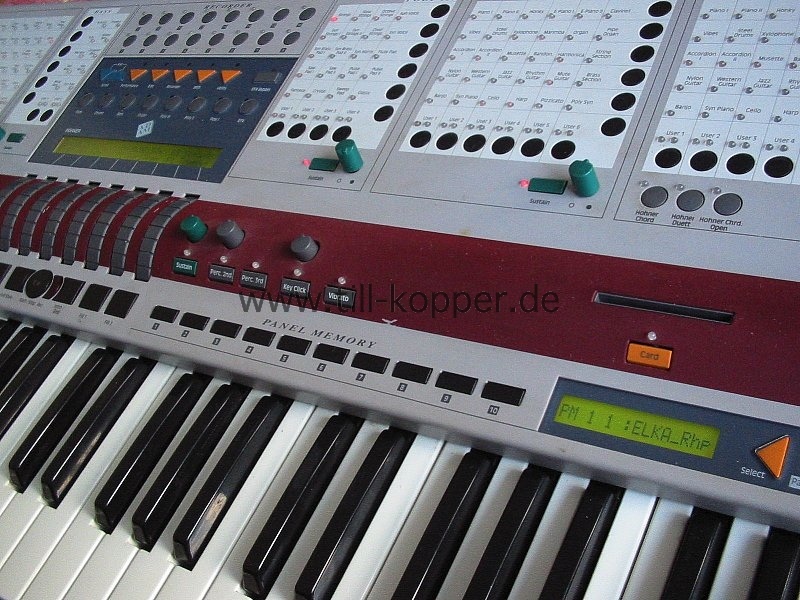 The user-interface was designed by the well known designer Axel Hartmann who did all the Waldorf synths design, some other companies products and also his own synth company "Hartmann". The design got some details that reminds us on the WAVE that was just introduced before the ADAM. And it is confirmed, that Waldorf did most if not all the software for it. The keyboard is split at a user defined splitpoint. And you can assign on which side of the split point (or on both sides) the section will be played. You can shift a section by plus/minus 2 octaves. But n detuning of them :( The first four section can be set to play polyphonic or monophonic. The three Poly sections are identically except for the protamento being available only in the Poly I section. These sections and the bass are able to play the same 256 ROM sample sounds. Each Poly section and the bass got a matrix to choose from a set of 50 (poly I), 30 (Poly II), 20 (poly III) or 10 (Bass) sounds in a fast manner. But with a click and a move of the wheels in the main section around the two lines of 40 characters backlit LCD you can choose each of the 256 ROM sounds too. You can assigne additional sounds or one of the 20 user edited sounds to the USER slots in the last row of these four sound section matrix. For editing a sample you got 2 ADSRs, a digital lowpass filter and an LFO. Thats all for sound design. The section on the very left is the rhythm and style section. It features all those well known General Midi drum sets to be played by preset music styles with matching bass and auto accompanying pattern. The tab button to tab in a tempo is as handy as the endless rotary tempo knob that will not give you unwanted tempo jumps as on other keyboards of the same age. You get two main variations of the patterns, two fill ins and an intro/outro button.. 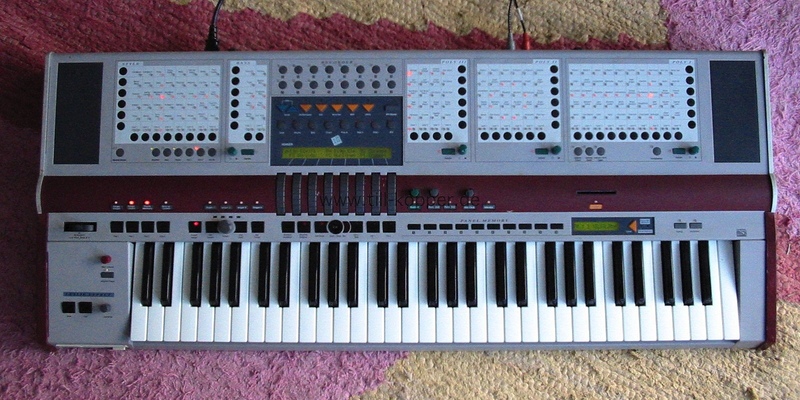 The drumsounds can be mapped to the keyboard with a single button. The set is then layed out on the keys as the GM rules are. You can import some other manufactures styles from that time. You can even record your own styles. For your own and importing styles, the disk drive is very comfortable. This "mass" storage is can also be used to save or import sounds or standard midi (.MID) files. On the ruby red like stripe you find the settings for the additional 8 tab draw-bar (actually the 8 endless thumb-wheels under the display are used) organ. It got its own distortion and two speed Leslie FX. In the edit menue of the organ you can adjust 7 parameters for the Leslie speeds and strength of phase shifting and the overall sound of the organ. You have 4 slots to store your organ setting to. or use the disk for mor. And there is also a card slot in this red stripe to the right hand side. I don't got a card with the instrument to check what type is used. And the manual is very short on those details. But you should be able to store all kind of ADAM data to it. More or less like you use the disk. The FX section features a very basic and simple digital reverb. You can choose from a few presets. Not parameter to be edit. The second FX chain gives you Chorus, Flanger and Delay. You got speed and depth for the chorus and the flangers. And (way to short) delay and feedback for the delay FX that share their slot with the chorus and flanger. Well, nothing to admire here by todays bench marks. The Panel Memory buttons just above the right hand side of the keyboard stores all used setting in a single memory slot. Hand to be used for each song you play live. It also stores the setting of the style accompany and rhythm. Like key-down start of the rhythm and its tempo. The keyboard is velocity and aftertouch sensitive Fatar one. The velocity is mapped to the volume of most sounds. The aftertouch is used for vibrato as hell as the Roland style pitch bend that introduces modulation if push to the back. In the Organ section the after touch is used to switch from slow to fast leslie (of cause the tempo changes in the user parameter set up- or down-speed slew rate. Well done! 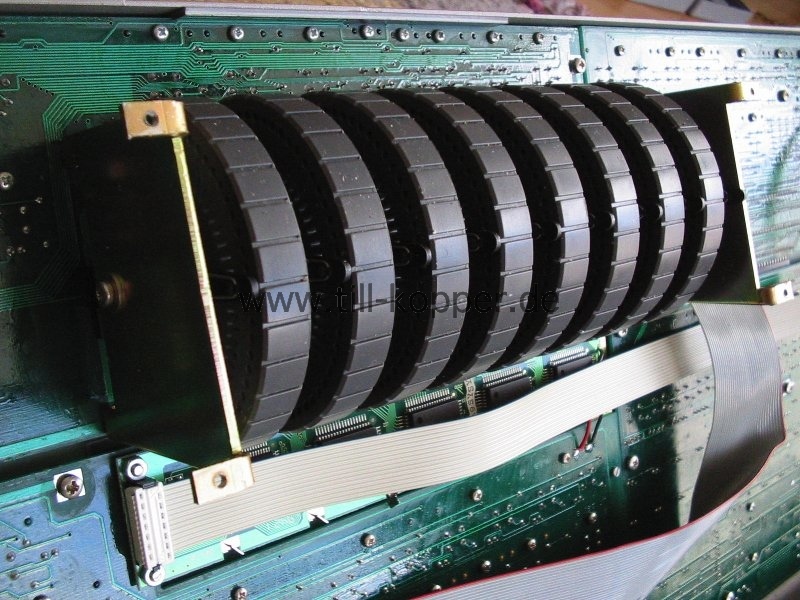 The 8 wheels under display are used to set things in the display. The upper row of characters in the LCD will give you the name of the parameter, and you set them by using the corresponding wheel below, The display will show you the value or mode you set in the lower line of the display. The wheels got an outer ring of round holes for the click feel and sound while turning it. And the inner circle of retangular holes is used for the light sensors that will tell the electronics inside the speed and direction of your turning. The very same concept of light sensors is used inside all computer mouses with ball (not the optical LED ones). 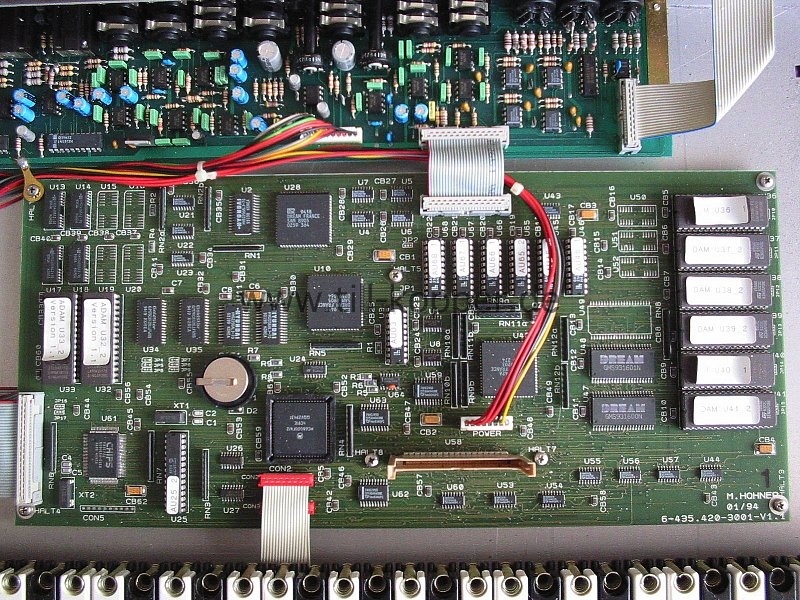 On the main board you spot the memory buffering battery of the common CR2032 type. I might add a manual how to open the ADAM later. The sound engine use the france DREAM chips. You see the ROMs for the samples and the OS. And you see an 68000 CPU for handling the interface data and the disk and card. All boards are labeled Hohner. I am not sure who did the boards R&D, because Hohner wasn't into this kind of electronics that much. All in all it is a nice keyboard for one-man bands. But there were better Japanese ones available at the same time. And although the design and interface is nice, it could not compete with them. So it did not sold that much.